How to make the car safely through the winter through some maintenance and maintenance is a problem that many car owners consider. The teaching equipment includes the shape and installation position of the parts, cultivates the students' understanding of the automobile, meets the training teaching needs of the automobile structure, working principle, fault setting and diagnosis, and combines the experimental teaching with the operation training to strengthen the students. Practical hands-on ability. The vehicle training room program has the characteristics of reality and real scene. Therefore, in the case of situational induction, this advantage should be fully utilized. By setting relevant knowledge into some situations, it is arranged into some scenes, allowing students to form judgments according to their own understanding, to operate, and to make these situations and scenes interactively appear along with the operation process, guiding students in specific operations. Use what you have learned to improve their ability to apply knowledge. 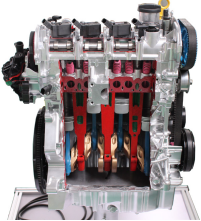 The director of Zhongshan Automobile Maintenance and Driver Training Association believes that vehicles with high temperature in winter do not need to replace low temperature engine oil and antifreeze coolant, but when using car electric equipment, the owner should try not to overload the battery, preferably for car battery. Charging. 2. Keep the thermostat working properly.